Interweave Knits Holiday Gifts 2012 features traditional knitting patterns, knitting techniques to learn, and knitted gifts for women, kids, men, and the home. Knitted gifts galore! The Interweave Knits Holiday Gifts 2012 special issue is packed with knitting patterns for women, men, children, and the home. Not just for the holidays, this special issue from the editors of Interweave Knits includes 43 knitted accessories for all your special occasions. From quick-to-knit cowls, knitted hats, scarves, and knitting projects for babies, to more advanced heirloom-quality knitted afghans and stockings, this issue will fulfill any knitter's gift list. Plus, this issue includes knitting techniques for double knitting, mosaic knitting, and even steeking. Grab your copy of Interweave Knits Holiday Gifts 2012 today and knit your friends, family, and even yourself a knitted gift to cherish. Enjoy 9 knitting patterns with Scandinavian-inspired designs, including stockings, knitted mittens, a beautiful sweater for baby, and other projects for the home. Bundle up with knitted scarf patterns, cowls, hats, mitts, and more. These 11 knitted accessory patterns are designed for every member of the family. These fun knitting patterns for babies and children will keep the kids cozy when school is called off for snowy weather. With 5 patterns for soft hats, mittens, and even a girl's sweater, these knitted gifts will be cherished even when outgrown. These knitted socks, cowls, scarves, and even a knitted lace beret are the perfect gift for your loved ones. With 9 patterns for all skill levels, these gifts are sure to be on any knitter's wish list. With over 40 knitting patterns for gifting or knitting for yourself, the Interweave Knits Holiday Gifts 2012 special issue is a gift resource you can turn to again and again. 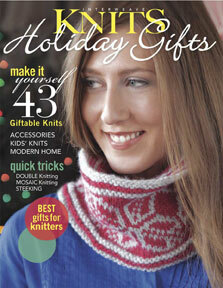 Interweave Knits Holiday Gifts 2012 is available in print (while supplies last!) and as a digital download. Order your copy today!